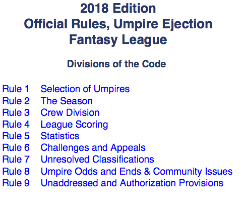 Announcing registration and UEFL draft, now open for the 2018 Umpire ejection Fantasy League season. Welcome to the 2018 Umpire Ejection Fantasy League preseason. This year's registration and draft form is now available and shall be due in one month's time (see below for precise deadlines). You may both register and draft your umpires at the same time or draft your umpires in phases, pursuant to UEFL Rule 1. All registrants will automatically be entered into both the standard and UEFL Express (umpire points only) divisions. The UEFL Rules have been updated for 2018. Participation in the UEFL is free and open to any visitor who wishes to play. Users play by drafting umpire crews consisting of one Crew Chief, two Primary Umpires, and two Secondary Umpires; there may be other opportunities to earn points during the season, such as through Case Play questions and scenarios. In order to draft a crew of umpires, you will need to complete the 2018 UEFL Registration and Draft form; you may use the same username as before if you participated in the past. Although guest commenting is enabled, UEFL Rules 4-7 and 6-1 state that users must be logged into the DISQUS commenting platform in order to initiate challenges. Thursday, March 29, 2018: Regular season begins. This season, there are no vacancies on the UEFL Appeals Board; thus, there will be no nominations. 4x: Gil (Commissioner, Chair), Jeremy (Deputy), tmac (Assistant), RichMSN (Charter Member). 5x: Arik G, cyclone14, MarkCanada, jvick2017, MLBUmpireObserver.